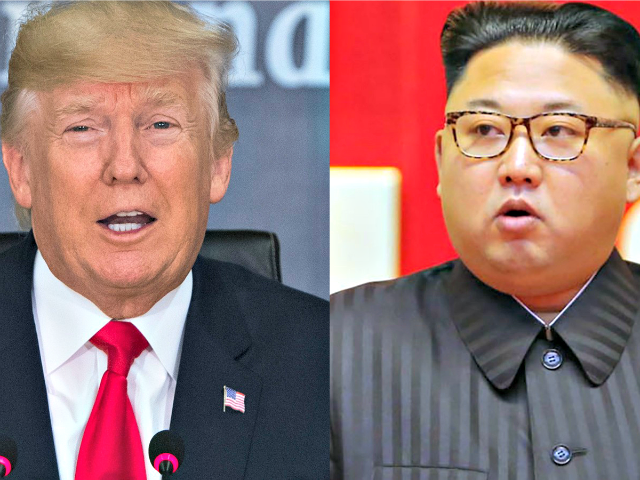 In an announcement at the White House Thursday night, South Korean National Security Director Chung Eui-yong confirmed that the North Korean dictator has extended an invitation to President Donald Trump to meet “as soon as possible,” and that Trump has accepted. Chung met with Kim Jong-un at an unprecedented meeting of officials from the two Korean states on Monday. Upon returning to South Korea, he confirmed to news outlets there that Kim had agreed to meet South Korean President Moon Jae-in at a meeting on the south side of the border. Kim also “expressed his willingness to meet President Trump as soon as possible,” Chung added. “President Trump … said he would meet Kim Jong-un by May to achieve total denuclearization,” he continued. He did not provide any specifics on time or potential location for such a meeting. The Trump administration has spearheaded a global effort to place unprecedented sanctions on the North Korean regime, which has consistently threatened to use nuclear weapons against American targets like New York and San Francisco. Trump has emphasized China’s role in enforcing these sanctions in particular, as the communist regime’s largest trading partner, and praised China’s communist regime for cooperating in part on pressuring Pyongyang. The tactic appears to have worked. According to a report in South Korea’s Chosun Ilbo, the sanctions are hurting Kim’s regime in an “unprecedented” way, particularly stalling North Korea’s ability to export goods for cash. Kim’s meeting with Moon would make him the first North Korean dictator to visit South Korea in history. His meeting with Trump, if it occurs, will also be unprecedented. Kim is the grandson of founding North Korean tyrant Kim Il-sung and father of preceding dictator Kim Jong-il. In talks with Chung and the South Korean delegation, Kim reportedly claimed denuclearization was his father’s “dying wish,” despite Kim Jong-il’s near-total commitment of the North Korean economy to developing nuclear weapons, rather than much-needed humanitarian aid for the millions of citizens starving in his country. North Korea forces thousands of citizens into gulags for “political re-education,” both for any behavior constructed as critical of the regime or for being related to anyone considered a threat. Under the tyrannical “songbun” caste system, families of lower “songbun” are banned from Pyongyang, kept out of the nation’s few well-earning jobs, and otherwise ostracized. Low “songbun” can be earned if parents, grandparents, or distant relatives were once opposed to Kim Il-sung’s rise during the Korean War. North Koreans are subject to public execution if caught with Bibles or foreign media such as Hollywood films. Disabled people, useless to the regime, are hidden from public view in labor camps. Chung did not mention if or how the meeting of the two leaders would benefit the citizens of North Korea.